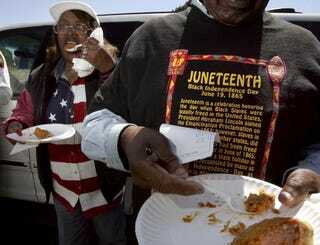 What Will Happen to Juneteenth? "So how do you celebrate Juneteenth?" I asked my Twitter friends a few weeks ago. After a dead-tweet silence, I retweeted myself for emphasis. Even then, just a handful of my 300 or so Twitter friends responded with a few half-baked answers. "Go to some crappy festival," one Californian said. "I celebrate by doing nothing," said a childhood friend from Texas. Unsatisfied, I polled my friends in Gchat conversations and Facebook status updates, where one of my brother's friends said she'd commemorate the holiday, simply, by "not slavin." A quick primer: On June 19, 1865, Gen. Gordon Granger stood on the balcony of the Ashton Villa in Galveston, Texas, to declare that President Abraham Lincoln had set all slaves free. This news, of course, came two years after the Emancipation Proclamation was issued and a couple of months after Confederate Gen. Robert E. Lee surrendered to Union General Ulysses S. Grant at Appomattox. Belated freedom, but freedom nonetheless. Worthy of a celebration? I'd say so, indeed. So why is it that some black people, especially Gen Yers, seem to be less than enthused about celebrating emancipation? OK, so maybe you're not from Texas and your ancestors already knew that they were free before June 19, 1865. That doesn't matter. We should collectively celebrate on one day, no matter the date, no matter where you're from. Think about it. How many holidays do you "celebrate" that have nothing to do with you? St. Patrick's Day or Cinco de Mayo, anyone? This year, a few of my Howard friends and I went out for St. Patrick's Day to chug a few Irish car bombs and tip our hat to the Irish ancestors that we may—or may not—have. And then came Cinco de Mayo or, as my brother called it, "Cinco de Drinko," when my Twitter timeline was filled with folks at "Mexican" fiestas, throwing back shots of tequila. Again, I took to Twitter (yes, I'm addicted) to say, "I hope all of y'all plan to go this hard for Juneteenth." Today, that doesn't seem likely. Somewhere, between slavery, desegregation, black middle-class flight to suburbia, and Barack Obama, Juneteenth excitement, in some places, has become lukewarm. James Griffin was a math teacher/football coach turned principal at Hamilton Park School, my mother's elementary school, when the school desegregated in the late 1960s. He grew up in Greenville, Texas, in the '30s and '40s and had learned about "the 19th of June," as it used to be called, through the celebrations the city had every year. "If we had not learned about it the way we did [through citywide celebrations], we wouldn't have known about it," he said. Even then, the school books and the teachers' curricula didn't highlight Juneteenth. (With the recent conservative changes to the history books, the Board of Education will continue with its miseducation of Texas school kids.) Griffin's neighborhood, much like that of my mother's, made sure that young people carried the torch for such an important date in not just black history but American history. When she was in school, my mother's uncle would take her and her brother to White Rock Lake every year to celebrate. While I was growing up, she'd wake my brother and me early on a Saturday morning to go to her old neighborhood's Juneteenth parade. In pockets of America, though, there will be barbecues, festivals, parades, and picnics taking place this weekend, from Sacramento to Portland to, believe it or not, Des Moines, Iowa. And of course, in Galveston, Texas, where Gen. Granger delivered the good news, there's a weeklong celebration filled with dances, exhibits, a gospel musical, a picnic, and a parade. James Josey, 62, who has been organizing Galveston's Juneteenth parade since he returned to the island in 1991, hopes that young people will come out and not just enjoy the free food, fun and games but also have a desire to one day take over the planning all the events, to make sure their children understand the holiday's importance. Like in Hamilton Park, though, Galveston ran into some funding problems in the past few years, too. After Hurricane Ike, Josey says, the city was too cash-strapped to support a Juneteenth celebration, but he was determined to keep the event alive. So Josey asked local stores and businesses to donate and to support the celebration. The community has to stay involved, he says, for the event to thrive and for there to be a greater understanding of the day's meaning. "It's not just a party or a parade," Josey says. "It's history." And it's a history that should be celebrated nationwide. Before he became president, Barack Obama supported a call to make Juneteenth a national holiday, and as of March of this year, 36 states recognize it as a state holiday. The push for a national day off, however, seems to have died down—so much so that a call to the National Association of Juneteenth Lineage was met with a "we're sorry this number is no longer in service" message. In a way, and I hate to say this, the celebration has taken on the same popularity wave of Kwanzaa. Remember when Kwanzaa was "the thing" to celebrate in the '90s? I guess every black holiday has its day. But Juneteenth, which is marked by a real historic event, should not be just a fleeting fad of the black community. It should be celebrated. Robustly. So this year, I'm starting my own grass-roots celebration ritual on the East Coast. I'll grab some of my friends, go to a black-owned restaurant, and tell the Juneteenth story to anyone who'll listen. Ideally, the good news will travel fast. Erin Evans is copy editor and writer for The Root. Follow her on Twitter and tell her how you're celebrating #juneteenth.